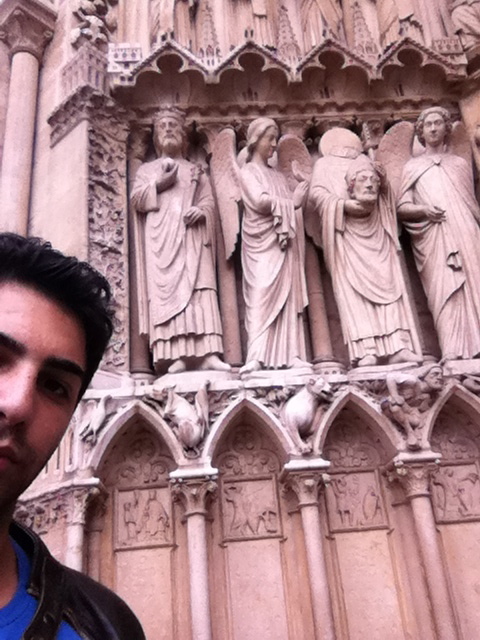 After walking around the city and visiting Notre Dame, i strolled into one of the restaurants around the area. I cant remember the name of the place because what attracted me most about it was the roaster they had just outside. It looked absolutely delicious. Walking into this place with beautiful mosaics of small villages of France on the walls made it all a more cozy place to sit and enjoy some wine. It was a lovely setting and i knew exactly what i wanted to eat. I asked for a combination of the meats that were on the roaster outside. 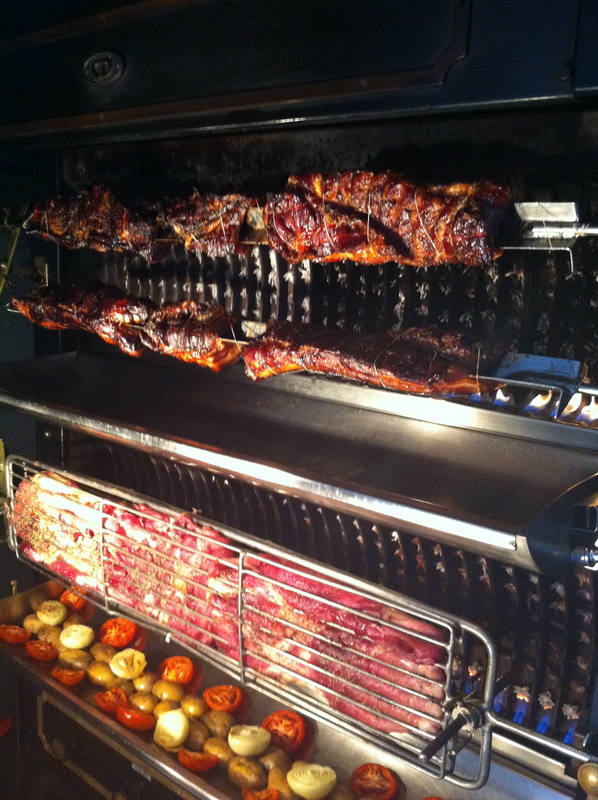 Chicken, Pork, and Lamb. The prices were significantly cheaper than the last two places i’ve been but that didn’t lower my expectations. The food arrived and i knew just by the look of the dish that i was going to have a feast. I thought for a moment that the Chef was American since the portions were big as hell. 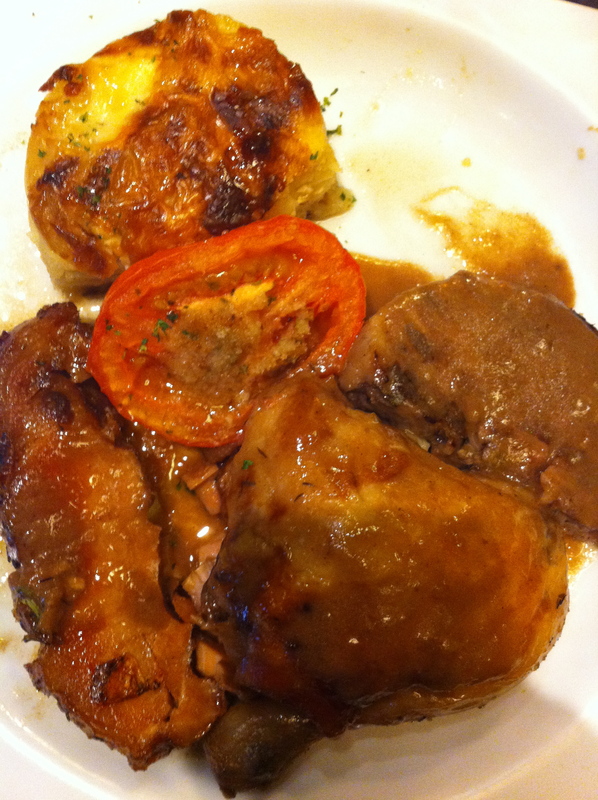 Chicken thigh with a Pork loin and Lamb fillet served with creamy potatoes and gravy, mmmmm. t was the best meal iv’e had in Paris all weekend. It was such a big portion though. But i wasn’t finished. To top it all off i treated myself to a Chocolate Mousse. The chocolate mousse did the trick. They served it in a large, deep glass filled from bottom to top with mousse. I killed it and It was delicious but i was completely done. All i wanted was to fall asleep. That place definitely rescued the disappointing food experiences i have had during this weekend. And it wasn’t at a high class restaurant, it wasn’t a posh place, it was just a place that charged no more than €20 for a dish that was delicious. And they made sure they filled you up. This weekend in Paris definitely made me open my eyes to some things. Good food should not be measured by the price of the dish, nor by the quantity of it. Fancy over priced restaurants can serve crap food. The taste of something new and delicious topped with a good red wine is enough to make someones day. And just because its Paris, doesn’t mean everyone knows what they are doing in the kitchen. In my experience, it was often the opposite.